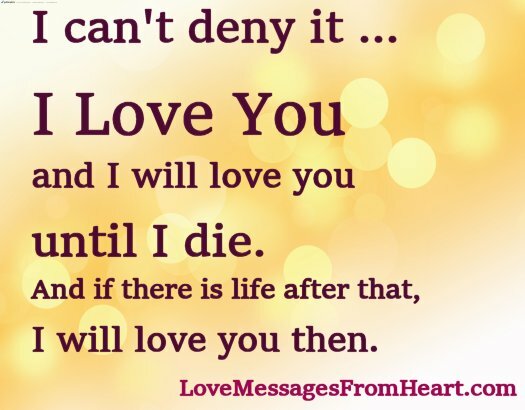 I can’t deny it … I Love You and I will love you until I die. And if there is life after that, I will love you then. I love you with my breath, my smiles, and the tears of my entire life. I love the way you talk, the way you smile, the way you hold me close and the many ways you show me how much you love me. I wrote your name on the pages of my heart, I reflected your face on the mirrors of my soul and I displayed you in the galleries of my eyes. I love you with everything that I am. I love you so much that at times it feels like my heart will burst with happiness. If there was a way to give you one thing in this life, I would give you the beautiful feeling I have each time I see you. Why do I love you? Because you are and always have been my dream…. and now my soulmate. Even if I don’t say it every day, know that I love you and I always will. Love is the greatest of all. This poem is lovely.